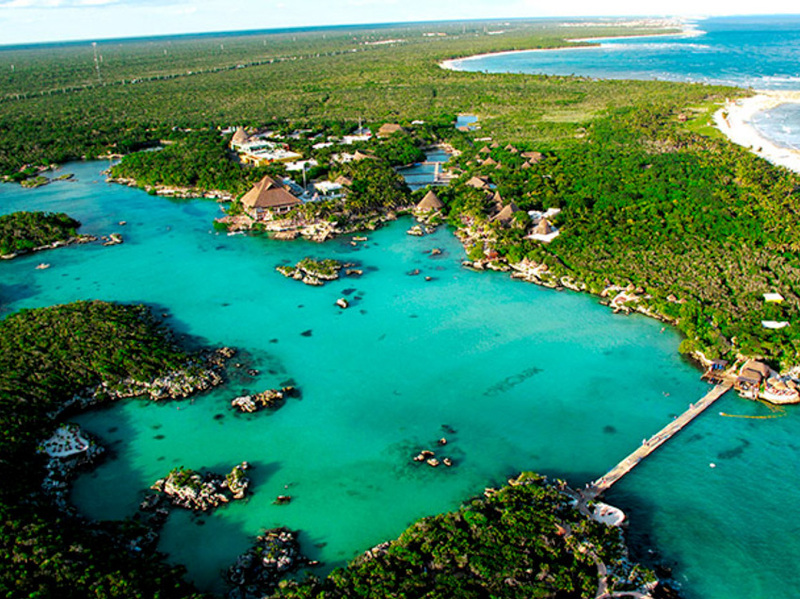 Mexico’s Riviera Maya is home to a wide variety of natural wonders, environments, marine life, and wildlife, many of which, are unique to the area. At some locations along the coast, there are spots with a concentration of these wonders, including; underground rivers, caves, lagoons, dense jungle, tropical fauna, exotic birds and animals, and more. At some of these locations, developers have carefully built what one could call “Entertainment Parks”, but with an emphasis on ecology and with a concentrated effort to maintain what nature has provided. It is this type of park that we refer to as a “Eco-Park”. While the large Eco-Parks on the coast, such as Xcaret and Xel-Ha can get pricey, depending on the package purchased, they do offer a full day of activities with a variety of amazing experiences and sights, all in one location. If limited on time while on the coast, but wanting to experience as many activities as you can, especially with kids, these larger parks are certainly worth considering. 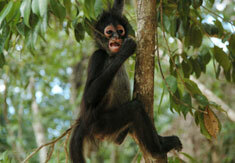 In addition to the large Eco-Parks, there are many much smaller parks and attractions in the area. 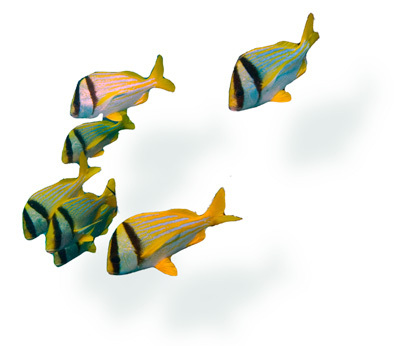 Although they don’t have a large variety of activities, they offer amazing experiences, are typicality more economical, and can be experienced in much less time. When visitors first see the lagoon at Xel-Ha, they can immediately understand why it was once a sacred and very important natural resource to the ancient Maya. 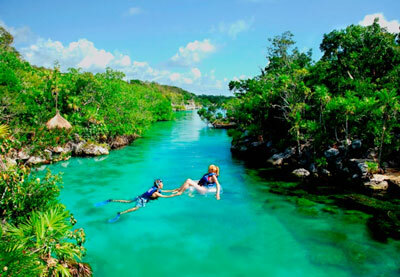 One of the largest on the coast, the lagoon at Xel-Ha is like a natural aquarium, offering visitors the opportunity to snorkel with a wide variety of tropical fish entering via a channel from the Caribbean Sea. 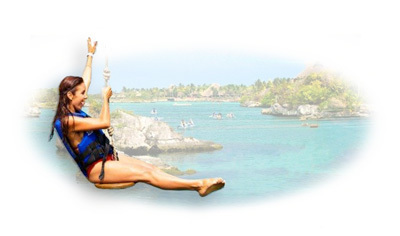 Activities and Attractions; Snorkeling in Xel-Ha lagoon, floating the Lazy River in inner tubes, aquatic zip-lines, five-meter high jumps, rope swings, hiking, jungle excursions, Children’s World, and much more. 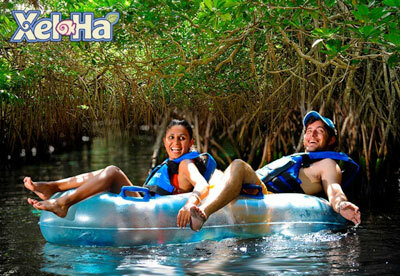 Packages are available for Xel-Ha that include: Domestic open bar and unlimited non-alcohol beverages, breakfast buffets, lunch buffets, Meliponary and nursery, Children’s World, tours of gardens and paths in the forest, unlimited snorkeling in the river and cove, lounge chairs, hammocks, life jackets, inner tubes, bicycles, snorkeling equipment, lockers, changing rooms, towels, restrooms, showers and parking. Remember to bring the printed proof of purchase of your park admission. Wear a swimsuit, comfortable beachwear and bring extra clothes. Sunscreen and insect repellent to be used in the park should be free of certain chemicals (see the Xel-Ha web site for a list). If your product does not meet these requirements, you will receive a chemical-free sunscreen sample at the information booth in exchange for yours, which will be returned to you at the end of your visit. Bring credit card or cash to purchase souvenirs and optional activities. Exit Akumal and turn left (south) onto Highway 307. Continue south for approximately 10 KM / 6 miles. Xel-Ha will be well marked by signs and is on the left hand side. The entrance road will lead to the parking area for the park. 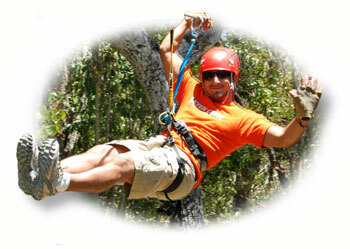 Visitors to the Riviera Maya that are looking for the largest variety of activities and attractions in one location need not look any further than Xcaret. 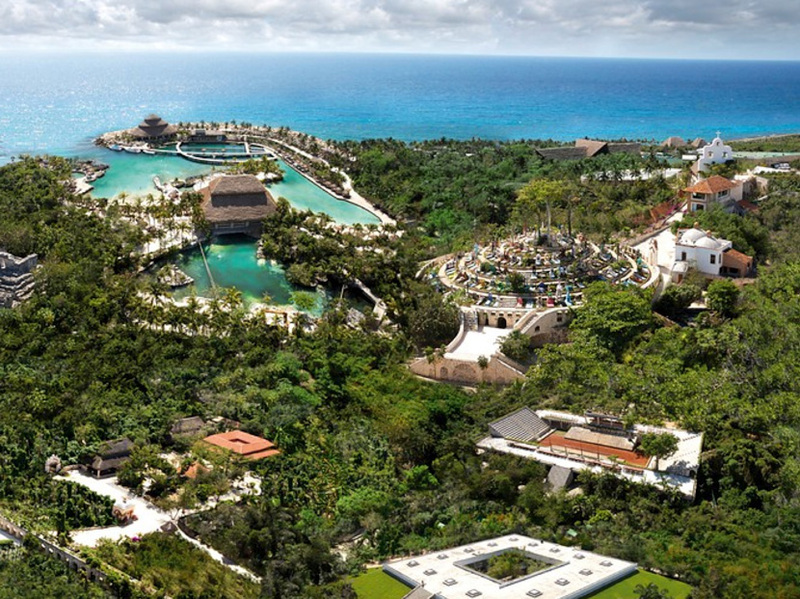 Located just a short drive to the north of Akumal, Xcaret is the largest Eco-park on the Riviera Maya and by far, offers the largest variety of activities and attractions. With a variety of restaurants, showers and lockers, day time activities and evening shows, one can easily arrive in the morning and depart late in the evening without experiencing everything that Xcaret has to offer. 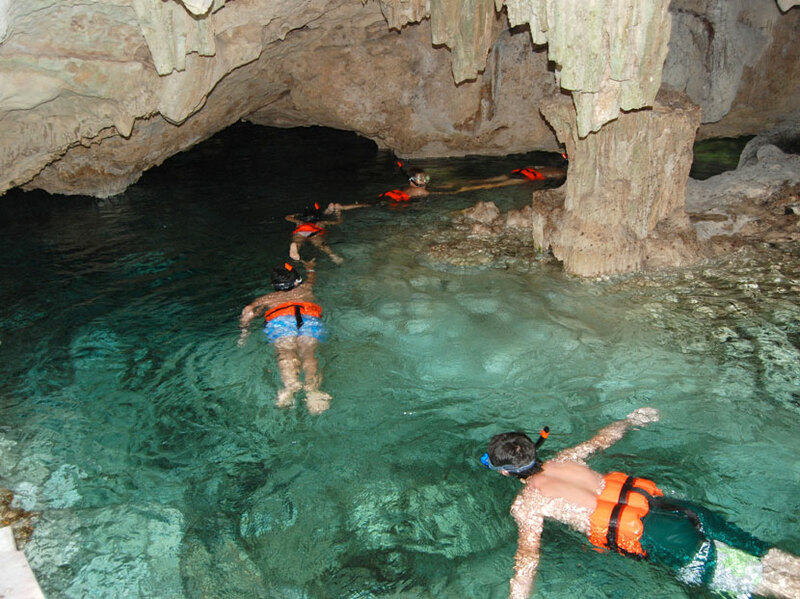 Activities and Attractions include; Maya ruins, Reenactments, Mayan and Mexican Performances, Traditional Mexican Dancers, lagoon snorkeling, cave snorkeling, subterranean river, Jaguar Island, Tropical Bird Sanctuary, Butterfly Pavilion, Orchid Farm, Coral Reef Aquarium, Sea Turtle Program, Dolphin Program, Botanical Gardens, Snuba, Sea Trek Underwater Adventure, and much, much more. Remember to bring the printed proof of purchase of your park admission. Wear a swimsuit, comfortable beachwear and bring extra clothes. 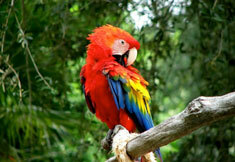 Sunscreen and insect repellent to be used in the Park should be free of certain chemicals (see the Xcaret web site for a list). If your product does not meet these requirements, you will receive a chemical-free sunscreen sample at the information booth in exchange for yours, which will be returned to you at the end of your visit. Bring credit card or cash to buy souvenirs and optional activities. Exit Akumal and turn right (north) on Highway 307, heading back toward Cancun. At approximately 19 miles there is a sign for Xcaret, marking the exit from Hwy 307 that you will need to take. Once you have exited the highway, continue north on the service road and within a mile you will reach the entrance which is on the right hand side. 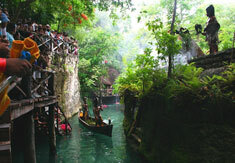 Upon entering Xcaret, signs will direct you to the parking areas. Located only a few miles to the south of Akumal and much smaller and lesser known than the larger Eco-parks on the coast, Aktun Chen offers visitors an authentic jungle experience without the crowds of the larger parks. 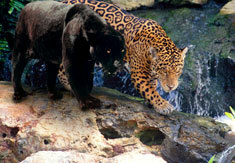 With a focus on conservation, the park is home to an amazing underground world as well as other activities. 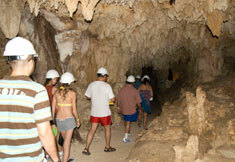 The ancient grotto situated in Aktun Chen is estimated to be approximately 5,000,000 years old. 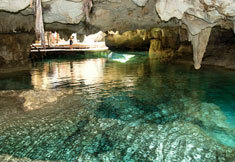 Covered with a dense relief of stalactites that fill the eternal dusk of this realm with enigmatic shim mer, it extends nearly 700 yards ending with a picturesque cenote where you can also snorkel and admire local underwater views. Noble and pure, full of roaming shadows and vague echoes, this place was widely used by the Mayans for practical and ritual purposes. You can still sense the presence of history here, imprinted in every stone, coming to life before your eyes. 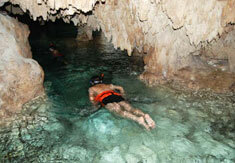 The site features several types of formations: Stalactites, Stalagmites, and Cascades. 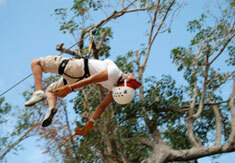 Activities and Attractions include; Dry Caves, Underground Snorkeling, Zip Lines, Exotic Wildlife and More. Exit Akumal and turn left (south) on Highway 307, heading toward Tulum. At approximately 2 miles there is a sign on the right hand side of the road with a picture of a stalactite, marking the entrance road. Turn right and continue on this road until you reach the parking area for Aktun Chen. The Eco-parks listed above are just a few of the many on the coast and we will be adding more to this site every few months. If you are heading down to Akumal for your vacation and are renting a car for your stay, it’s always fun to explore the Riviera Maya to see what natural wonders you can discover on your own.